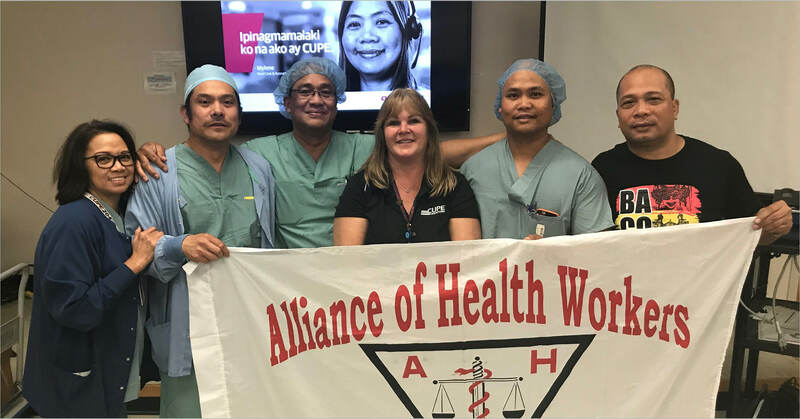 In May, Robert Mendoza, President of the Alliance of Health Workers Philippines (AHW) came to Winnipeg on a CUPE-sponsored visit. It was a great pleasure for me and my members to spend time with him. Mendoza travelled from the other side of the world to meet with CUPE members, learn about our struggles, and share the struggle of health care workers in the Philippines. Even though we are thousands of miles apart, we have common struggles as workers. Government cutbacks are driven by money, and hurt patient care. Front line workers are not consulted about changes in the workplace or in the health care system, and workers are often fighting for better standards of care. The Philippines has a two-tier public and for-profit health care system, something we are trying to keep out of health care in Manitoba. After hearing about the impact it has on people in the Philippines, particularly the poor, I feel inspired to keep fighting for public health care. CUPE members appreciated hearing about the challenges facing Filipino health care workers. For several members, this discussion allowed them to receive an update about the situation back home, where many grew up and still have family. Mendoza was clear that the conditions of unemployment and lack of access to health care mean many people live in poverty or are forced to migrate to other countries in search of work. The AHW believes that the right to health care is a right for everyone in the Philippines, and there is a great deal of solidarity within the membership to achieve this goal. They face powerful pushback from their government, and know they need to unite to be able to win their fights. At a rally protesting the closure of a hospital emergency department, Mendoza was surprised we were not harassed by security, and that police did not remove our campaign material from the public spaces. I felt uneasy knowing we have the right to campaign and protest when these rights are repressed in the Philippines. I also felt that facing repression has built a stronger sense of solidarity within the AHW membership. After spending time with Brother Robert, I believe that fighting for your life means you will fight harder, and maybe there are things here we should fight harder for as well. He was able to make important connections with CUPE members and reminded us how important it is to fight public sector cuts and privatization. Debbie Boissonneault is the president of CUPE 204, representing over 7,000 health care workers in 20 health care facilities across Winnipeg and Manitoba.